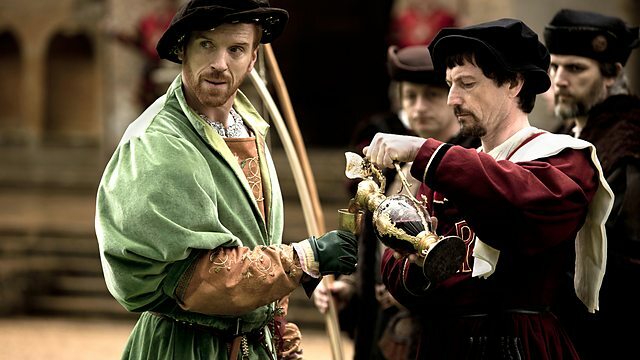 In this recap, I will try to unravel some of the complexities of the relationships in the court of Henry VIII, which are shown on Wolf Hall without much effort to explain. While such a sophisticated script yields rich rewards, it assumes a certain working knowledge of 16th century power players. The courts of the Tudor monarchs were unlike those of their Plantagenet predecessors. Nor does the 16th century heart of power resemble the regimes of the latter Stuart monarchs and succeeding Hanoverians. There is a highly personal nature to ruling the kingdom—and with that comes deadly risks to those who seek favor and influence. Although the power structure may be unfamiliar to some viewers, the dilemma of the series’ protagonist, Thomas Cromwell, is not. The obstacles and temptations Thomas Cromwell faces in “Entirely Beloved” are highly relatable. Cromwell is like the chief of staff of an important politician driven out of office who must now balance his fierce loyalty to his mentor against his own undeniable ambitions—and need to support his household. It could be argued that in this episode, the script goes too far in creating a hero that today’s viewer will root for, at the expense of accuracy to beliefs and attitudes consistent with a society moving from the medieval age to the early modern era. As the episode opens, Cromwell is making one of several attempts to advocate for Cardinal Thomas Wolsey’s cause to King Henry VIII. Because Wolsey failed to get the king his desired annulment from Queen Catherine of Aragon, he was replaced as Lord Chancellor and no longer manages the affairs of England. Wolsey is depressed and fearful, living in his country “refuge” and hoping for reinstatement. The king’s sidelong glance at the courtiers who surround him explains what he can’t put into words. Henry VIII was pressured to reject Wolsey not only because of his failure to maneuver the Pope into granting the king his annulment. The nobles of the kingdom—principally the dukes of Suffolk and Norwalk—were Wolsey’s passionate enemies. The old families felt that they should advise the king and hold lucrative positions, as had been the prerogative during the reigns of the Plantagenets; the rise of the butcher’s son, Thomas Wolsey, infuriated them. Anne Boleyn hated Wolsey for her own reasons. Once the cardinal was shown as fallible by not obtaining a quick annulment, it gave Anne Boleyn and the jealous nobility their moment to convince Henry VIII to toss aside the man who’d managed the kingdom since 1514. The cardinal tells Cromwell that a black cat gave birth to kittens under his bed. And he fears it is a bad omen. But Cromwell holds one of the kittens, in delight. The bond between human and animal is a recurring motif, used throughout this episode as well as the entire season. There is strong documentation, in art and letters, for Tudor affection for dogs and horses and hawks. But Cromwell’s cuddling kittens is possibly anachronistic. Cats, especially black cats, were viewed with distaste and fear in the late medieval age. Pope Innocent VIII ordered the killing of cats in 1484 as allied with witches. While Hilary Mantel’s books position Cromwell as more enlightened than his peers in his scorn of superstition, cradling a black cat may go too far. Elizabeth I, the heroine of the English Protestant age, ordered cats burned alive at her coronation to release their demon spirits. It is dogs that are under discussion when Cromwell returns home. His son, Gregory, has returned from school for the Christmas season. In the first episode, Cromwell’s wife, Liz, died of the sweating sickness, as did his beloved daughters. Gregory, who appears to be about 14, is the only immediate family he has left. But we already know that Cromwell thinks his son’s Latin is poor. When the two are alone, their conversation is strained. Gregory is preoccupied with his two greyhounds, and whether his friends at school will continue to tease him because his dogs are black instead of white. However, in the next scene, Cromwell seems troubled by his relationship with his son and asks his sister-in-law, Joan, if she thinks Gregory is afraid of him, and if so, why. She reassures him. Joan, married to a man we never see, stepped in to help the family after her sister Liz died and she is clearly becoming close to Cromwell. “Seems like such a long time since there was a baby in the house,” says Cromwell sadly. When Liz says she has no intention of having children, he asks why. Liz says her husband’s “duty is not my pleasure.” She scoots out, embarrassed. “That’s a conversation I shouldn’t have had,” Cromwell says to himself. Which is amusing, though it sounds like a 2105 attorney worrying about sexual harassment suit. Cromwell and the cardinal’s loyal gentleman usher, George Cavendish, agree it might be time to move Wolsey farther away from London. As the archbishop of York, he could reside with some dignity in the North. But they have no money to move him. A second attempt with the king to advocate for Wolsey is more successful. “I’ll say this, you stick by your man,” says Henry VIII. He waits until no one else can hear their conversation and then tells Cromwell he will give Wolsey one-thousand pounds. “Don’t tell anyone.” Looking tormented, the king says, “Every day I miss the Cardinal of York. Ask him to pray for me.” The strain that Henry VIII is under, as he continues to press the pope unsuccessfully for an annulment from a queen possessing powerful European connections, is mounting. With the king’s money, they can put Cardinal Wolsey on the road north for a “tactical retreat.” He asks Cromwell to come, but his protégée says he will arrive later, to bring news of Wolsey’s recall. The cardinal seems to accept it. Wearing his scarlet robes, Wolsey says, “God bless you, mine own entirely beloved Cromwell” to the kneeling man. He then slips Cromwell a wrapped ornate box for “when I’m gone.” Both men struggle to control their emotions. A sequence that is a complex mix of lightness and menace unfolds at the Chelsea home of Sir Thomas More. The friendship between King Henry and More is never shown in Wolf Hall, but it was a deep one, built on mutual respect and scholarly interests. In the first episode, Cromwell is shown as praising the education of his daughters, which is possible but there is no historical evidence to support it. However, there is ample documentation of More’s pioneering belief in the education of women. Following this, More mentions, seemingly in passing, he intends to proceed against William Tyndale, the English scholar living in hiding who is translating the bible into English. “You’d know him if you saw him, I suppose?” he asks Cromwell. “So would you, I suppose,” Cromwell answers without quite answering. A moment later: “Have you found sedition in Tyndale’s writing?” Cromwell asks. Cromwell’s next series of challenging encounters are with three women Henry VIII is famously connected to: Mary Boleyn, Anne Boleyn and Jane Seymour. Mary is in the king’s past as a mistress and Jane in his future as a third wife. Anne is the present, and she presides like a queen, perched on a throne-like chair in her grand home. But first Cromwell speaks to Mary Boleyn, who asks him to obtain her some gray velvet from Italy (“It’s been ages since I had new clothes”) and, moments later, suggests they get married because she is in need of a husband “who upsets them.” In this case, the “them” is her father, Thomas Boleyn, who complains she is “a mouth to feed” and her uncle, the duke of Norfolk, who calls her a “whore.” She is a lady in distress, but Cromwell, though he finds her attractive, holds back. Mary advises him to walk in the other direction when Anne Boleyn tries to get him to “do some little thing for her” and “make you hers,” but when Anne does indeed ask Cromwell to find out who planted a mocking cartoon in her bedchamber (one showing her without a head), he agrees. Cromwell meets Thomas Cranmer, the Boleyn family chaplain, and finds his soft-spoken manner and religious-reform views agreeable. The two men speak to Jane Seymour, whose self-deprecation is in direct contrast to Anne’s arrogance. She admits her family sent her to wait on Anne Boleyn in order to spy on her, but since she can’t speak French, she’s hopeless at it. Cromwell finds her charming. Cranmer takes Cromwell for a walk to the stable, where they feed apples to the horses. There Cranmer warns his new friend that the duke of Norfolk and others still hate Wolsey and think he is dangerously active in the north of England. A line has now been crossed. Cromwell works for the king. Henry VIII also confides in Cromwell that Anne Boleyn is threatening to leave him because it’s taking too long to achieve the annulment. She will not sleep with him until they are married. “I will be unmanned by” such frustrated lust, he complains. It is clear that Cromwell is manipulating the king’s fears to set him more firmly on the path of breaking with the pope. Henry’s fears seem foolish to some modern viewers, but his belief in dreams and fear of how he will be received at his moment of divine judgment are in accordance with late-medieval beliefs. Again, Cromwell is given a rather unfair advantage by acting out of the time period and more how someone would act today. An emerging Cromwell is greeted with relief by his son, nephew and aide Sadler. “Your children love you,” comments Cranmer with a smile. Back home, Joan is even more relieved to find Cromwell alive and well. The two give in to their desire for each other, and spend the night in bed. The next morning, a buoyant Cromwell sings a song he learned while living in Italy and entertains Wriothesley and the others with a story of how he sold a fraudulent religious statue to an Italian cardinal “for a cut” of the gold. But inside the house waits George Cavendish, with devastating news. Cardinal Wolsey is dead. Henry Percy, the earl of Northumberland and Anne Boleyn’s onetime would-be husband, arrived to arrest him for high treason. The cardinal tried to bluff his way out of the arrest, but without Cromwell it wasn’t possible. The final scenes show a comedic sketch at court. Courtiers Norris, Brereton, George Boleyn, Francis Weston and musician Mark Smeaton act out the death of Wolsey and his descent to hell with enormous cruelty. The King, Anne Boleyn and the duke of Norfolk laugh. (It is the first time the series has shown Henry VIII and Anne Boleyn together.) Cromwell watches it all from the side, deeply upset. Cromwell’s son plays with his two new greyhounds. They are white. All of the principal players of the English Reformation are now in place.